Is the outcome following limb salvage in military patients superior to that of amputation? HomeNewsPublicationsIs the outcome following limb salvage in military patients superior to that of amputation? Just as in the wars of the last century, injuries sustained in the recent conflicts in Iraq and Afghanistan more commonly involve the limbs than any other anatomical region. An article (Penn-Barwell JG, et al. Medium-term outcomes following limb salvage for severe open tibia fracture are similar to trans-tibial amputation) recently published in Injury demonstrates that medium term outcomes for young military patients are similar following trans-tibial amputation or limb salvage following battlefield trauma. 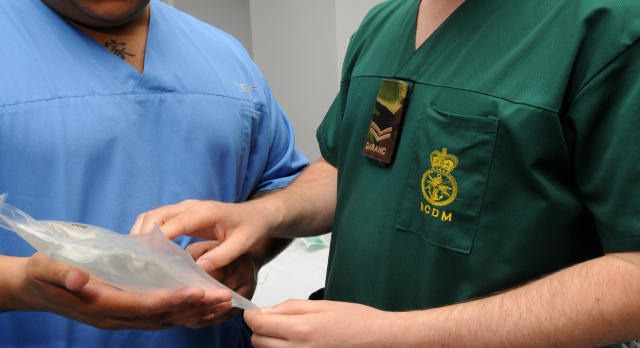 The study, which involved several members of the NIHR SRMRC and Royal Centre for Defence Medicine teams including NIHR SRMRC Deputy Director Mark Midwinter, compared military casualties undergoing limb salvage for severe open tibia fractures and the equivalent outcomes for unilateral trans-tibial amputees. Professor Surgeon Captain Midwinter said: “In summary amputation may yield improved early functional results at a reduced cost, but over a patient’s life, limb salvage may prove to allow greater function at a lower cost overall. “This effect has been observed in the care of wounded military personnel with salvaged limbs who frequently report frustration when comparing their own pace of rehabilitation to that of their amputee comrades and subsequently request amputation.